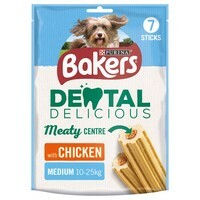 Bakers Dental Delicious with Chicken are tasty meat filled chews that help to reduce tartar and plaque build-up, keeping your dog's teeth and gums healthy. Low in fat, these truly delicious chews feature a chewy outer that actively works improve oral hygiene, while the meaty chicken filling provides a great tasting flavour that your dog won't be able to resist. Just one chew a day is enough to keep your dog's oral hygiene at its best!